Step 1 Pre-heat the oven to 200C/400F degrees. Step 2 Using a hand whisk, mix the coconut flour, baking powder, salt, pepper and psyllium powder in a bowl and combine well. Add the butter and eggs and mix thoroughly until the mixture looks like breadcrumbs. Add the Marinara sauce and basil and combine well. Boil the water and add to the mixture a bit at a time, stirring thoroughly until you have a dough. Wait for the dough to cool slightly before using your hands to shape it. Step 3 Cut the dough into four equal quarters. Take one of the quarters and roll into about an 8 inch log. Join the two edges to make into a bagel shape, pressing together firming. Place on a parchment covered baking tray and place in the oven. Step 4 Bake for 15 minutes, then turn the bagels over and bake for a further 15 minutes. Eat and enjoy! These tomato basil bagels are a colourful and tasty way to start the day. Great toasted, with soup or split and used for a sandwich. Or simple toasted. 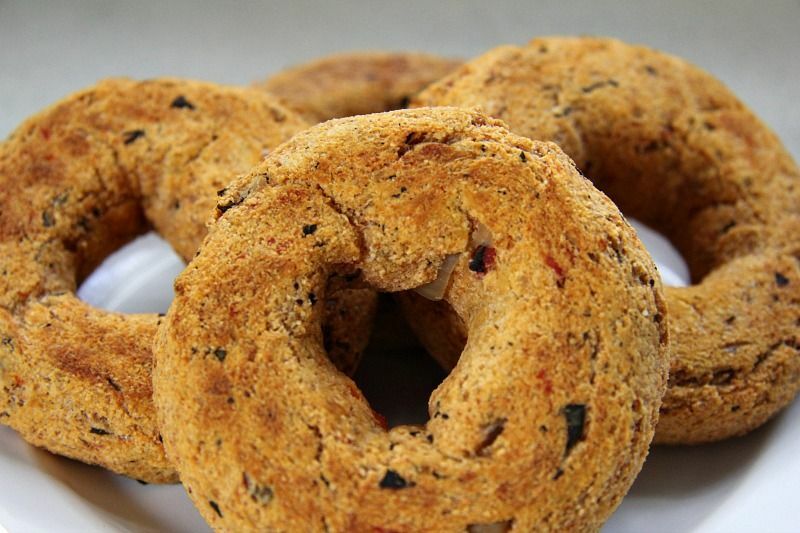 This is one of my best low carb bagels but is for those with a savoury palate. These tomato and basil bagels are delicious simply toasted but my favourite way to eat them is with a slathering of cream cheese. Another great way to eat these tomato basil bagels is to split them and serve with sliced avocado. Add some mozzarella cheese and that’s a very tasty lunch.